Getting to Yes1 was one of the books I had on my Kindle app for years. I finally took time to finish over the year-end break. I recommend everybody to read. "Getting to Yes offers a straightforward, universally applicable method for negotiating personal and professional disputes without getting taken and without getting angry." - from the book introduction on William Ury's web site. "...all too often negotiation end up like the proverbial children who quarreled over an orange. After they finally agreed to divide the orange in half, the first child took one half, ate the fruit, and threw away the peel, while the other threw away the fruit and used the peel from the second half in baking a cake." If we focus on our positions (i.e. where to split the orange), we may be ignorant of each other's underlying interests (eating the fruit and baking a cake), ending our negotiation in a suboptimal agreement while we could fully satisfy the interests of both parties. This example also illustrates a counter-intuitive nature of negotiation: It is often the difference in the interests that makes a creative solution possible. The book also gave me a concrete measures on how much negotiation power we have. Such measurement comes from BATNA, or Best Alternative To Negotiated Agreement: "What options do I (and others) have if this negotiation does not reach to an agreement?" Finally, the authors reminded me that building relationship is the first step before anything because we are negotiating with individual humans whether it is a talk between a husband and wife or a talk of nations. While I was reading, I thought of one of a few occasions in my life that I took on a seemingly tough negotiation, and resolved in a creative way. After getting Ph.D., I started to work for an oil field services company. It was the year 2007 when I needed to apply for a work visa (H1B) to continue working in USA. The economy was just before the great recession, and the number of visa applicants were very high. To everybody's surprise, my visa application was rejected, saying that the field of study (Ph.D. in biodmedical engineering) does not match the position in the company (a software engineer in an oil company). The company proposed that I should be transferred to their London office for a year before I apply the visa again. I thought that was not acceptable because it might damage the relationship with Yvonne, then my girlfriend, especially under the circumstance that her father was very sick. Since Yvonne and I were thinking to get married soon, I proposed the company if they would pay the application and attorney fees in processing my green card through our marriage. I thought this totally made sense because the company's interest was to retain the productive employee, and cost of processing a green card must have been lower than transferring someone internationally. It was me and Yvonne's interest that I stay in USA, and avoid the big personal expense in processing my green card through marriage. The company indeed favored my proposal. Everybody's interest was satisfied, my green card process went without any problem, and Yvonne and I are happily married forever since then. 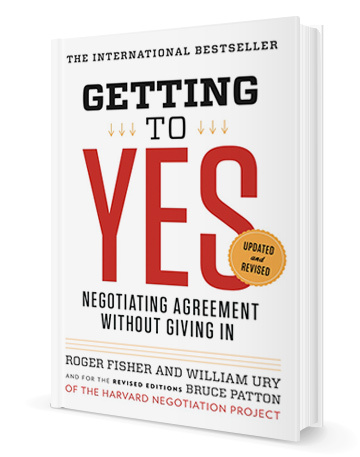 After reading Getting to Yes, the negotiation started to look like a fun collaborative exercise rather than hostile talk among disagreeing people. It is a process of collecting intelligence and solving problem creatively, rather than playing a tug-of-war of positions. The outcome of the negotiation is also greatly affected by one's emotional maturity to build firm relationship with others so we can solve the problem together rather than seeing each other as mere opponents. It takes time to deepen the art of negotiation. Yet it is worth investing our time to be better at it so we satisfy not only our lives but also on the other side of the table. I will seek the opportunities to practice this art from now on through out my life.